, a French writer, was born of Protestant parents Sept. 7, 1615. His father was a tradesman; his mother Louisa was the sister of the learned Samuel Petit, minister of Nismes. These dying when he was young, his uncle Petit educated hioi as his own child. 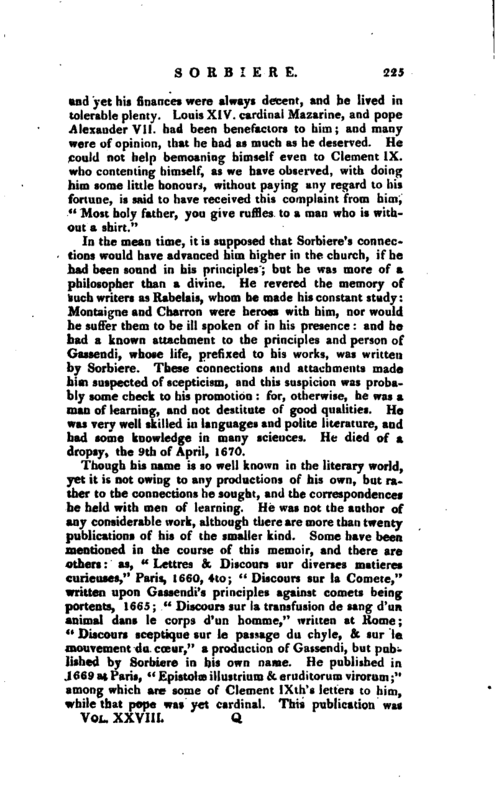 Having laid a proper foundation in languages and polite literature, he went to Paris, where he studied divinity; but, being presently disgusted with this, he applied himself to physic, and soon made such a progress, as to form an abridged system for his own use, which was afterwards printed on one sheet of paper. He went into Holland in 1642, back to France in 1645, and then again to Holland | in 1616, in which year he married. He now intended to practise, and with that view went to Leyden, but again changing his mind, was scarcely settled at Leyden, when he returned to France, and was made principal of the college of Orange in 1650. 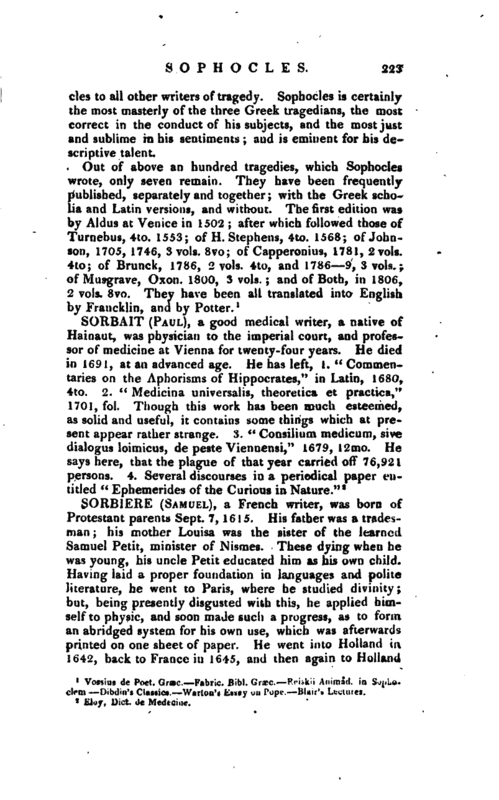 In the mean time, it is supposed that Sorbiere’s connections would have advanced him higher in the church, if he had been sound in his principles; but he was more of a philosopher than a divine. 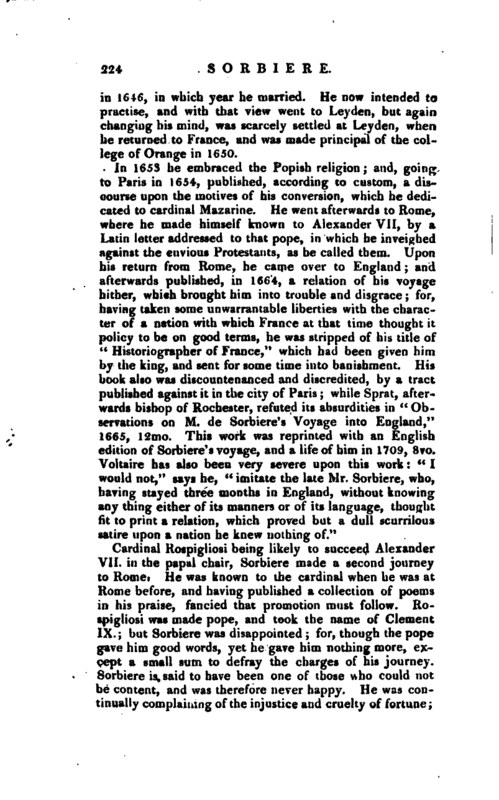 He revered the memory of such writers as Rabelais, whom he made his constant study: Montaione and Charron were heroes with him, nor would he suffer them to be ill spoken of in his presence: and he had a known attachment to the principles and person of Gassendi, whose life, prefixed to his works, was written by Sorbiere. 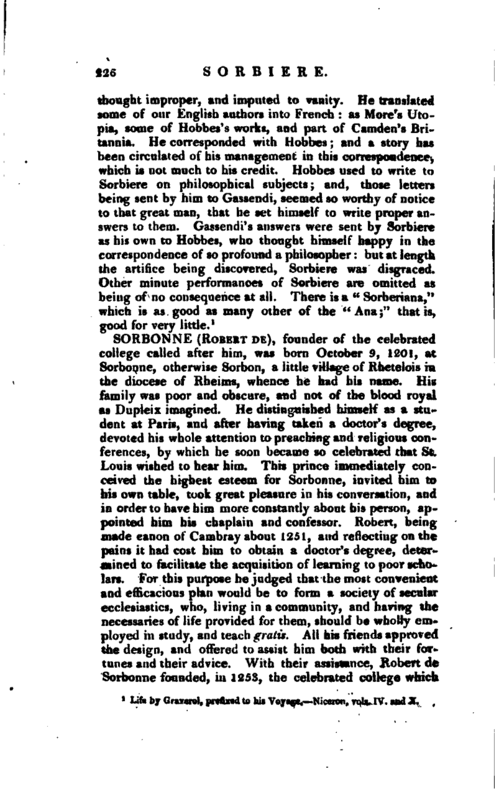 These connections and attachments made him suspected of scepticism, and this suspicion was probably some check to his promotion: for, otherwise, he was a man of learning, and not destitute of good qualities. He was very well skilled in languages and polite literature, and had some knowledge in many sciences. He died of a dropsy, the 9th of April, 1670. Life by Graverol, prefixed to his Voyage.—Niceron. vols. IV. and X.